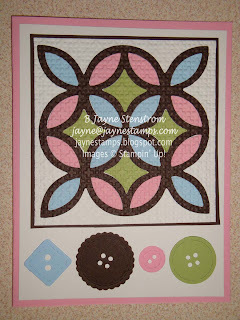 I saw this card on another blog, Stamping to Share, and have wanted to make it for awhile. Earlier this month this was one of the projects we did at our Chalk-a-holics meeting. I love how it turned out! All cardstock was cut using the Lattice Bigz die - so I cut Early Espresso, Certainly Celery, Pretty in Pink, and Bashful Blue cardstock with the die, and then just took the pieces out of the centers and glued different colors back in place. The final touch was running it through the Big Shot with the Square Lattice Embossing Folder. 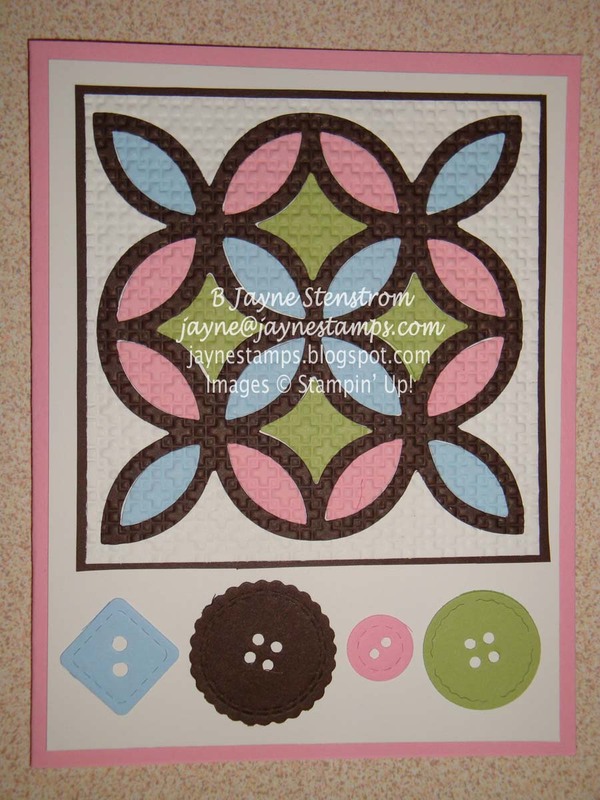 The "buttons" were cut with the same colors using the Buttons #5 Sizzlits die. You could also leave the buttons off the bottom and stamp a sentiment there.